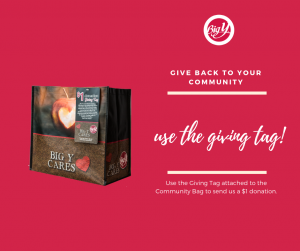 We’re excited to share that Big Y stores are now offering the Community Bag and Giving Tag Program! Every time a shopper buys the reusable Community Bag at any Big Y store, they can direct a $1 donation to us by using the attached Giving Tag. Visit your local store and pick one up today! Our local Big Y stores are in Groton at 995 Poquonnock Rd and in Mystic at 79 Stonington Road.